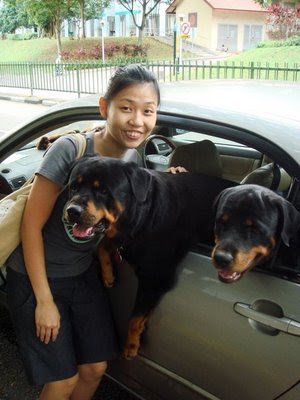 Say hi to Auntie Jane, a Specialized teacher currently in ACS doing a small favor for Pa! I think its the first time she is meeting us... and she is totally a cool teacher. It was pretty ok... a little boring I suppose. We would have much preferred to go to the beach... Did you know that KM8 is no more? *sob* they were so friendly there! 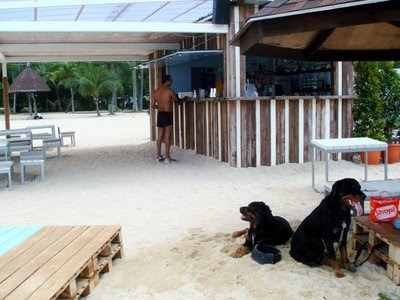 Now its replaced by a small snack house that still serves alcohol called The Shack. And they are also the new owners of the previous KM8 spot. 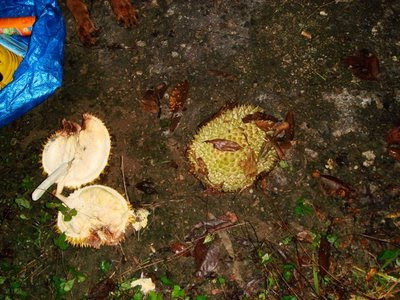 But I guess the most exciting thing that happened was the DURIAN HUNT! WOOHOO! talking about walking about in the dark! 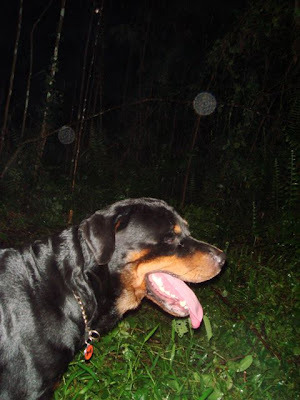 It was Dark and it was Foggy. Can you see me in this picture? 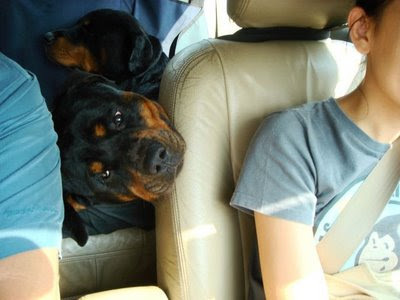 Bruno as usual is utterly fearless... but his silly antics had him have cuts all over his legs. Pa later had to do a little first aid on his paws. 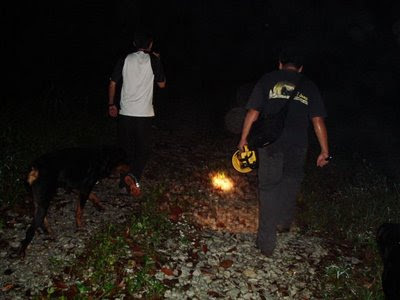 We heard some other wild dogs in the forest harressing some poor durian hunter as well... Lucky they didn't come over to OUR SIDE. 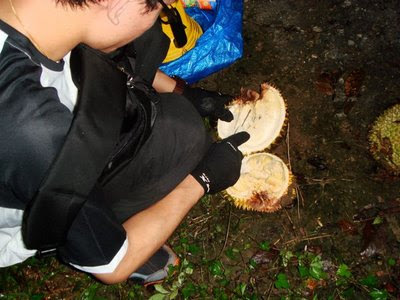 The entire thing lasted for quite a few hours... We waited for the "THUD" in the middle of the jungle... and RUSHED to grab it... there were a few others around... but they were pretty good at getting durians as well. These were some of the other "uncles" that were along for the hunt! One of the specifically said to remove his head if I wanted to post up this picture. OUR VERY FIRST DURIAN! we heard it THUD and after a 15 min search we FOUND IT! it was half spoilt and the ends had already split... but the good parts were SUPER GOOD. 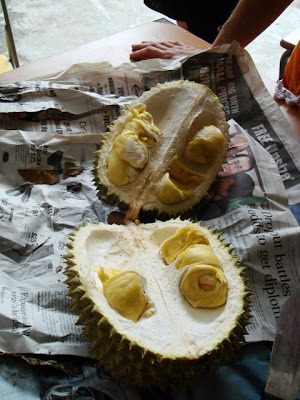 My goodness... we have found the best durians in the world... either that or the effort made it the best. just as we picked up the first... there was another thud and it was a beautiful intact durian. The excitement after such a long wait was actually pretty thrilling. 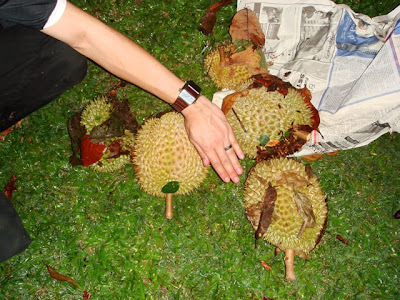 At the end, we manage to pick about 3 really huge durians and 2 other smaller *coughdonatedcough* durians. Pa then brought it back to the work place to be shared with everyone! 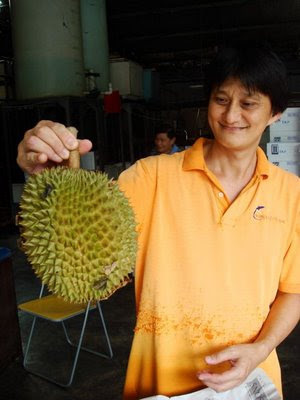 Look at the size of the durian! And honestly, it was really really good. For those not in the know, Durians are considered the KING of fruits... and it is a MUST TRY if you ever come to South-east asia. 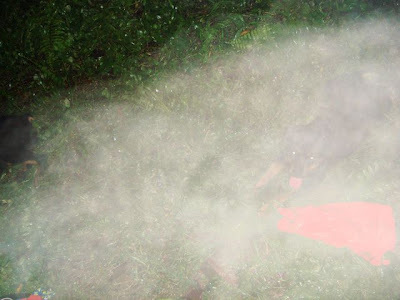 Hi Bear Bear, is this in Singapore? where where ? really got durian trees? Is it from private durian farm? Btw,when can Chelsea meet the boys hur? hee.